Publisher CBS Publishers & Distributors Pvt. Ltd.
Chemistry of Pesticides is the outcome of problems faced by the author and colleagues while imparting knowledge on pesticide science. Although a few books on pesticide science are available in the market but none of them could be recommended as a textbook to our students as they fail to cover all areas of prescribed syllabus of agricultural universities in India. 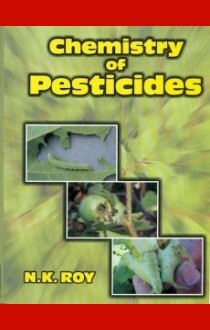 This book reveals a detailed discussion on recent developments both on synthetic and natural insecticides fungicides nernaticides herbicides rodenticides pheromones hormones attractants repellents etc. incorporating their chemistry mode of action metabolism and photochemistry. The author discusses the new ideas on the design of potent pesticides with the help of QSAR and CAMM. The future pesticide scenario is depicted in the background of intellectual property rights Indian patent system following WTO agreement and phytosanitary measures. An information on environmental safety aspect new generation of formulation biotechnology in pest management programme Insecticides Act and regulatory aspects of pesticides and safety measures in handling and use of pesticides are also highlighted.